I've been wanting to contribute to Presto Pasta Night for awhile now but just haven't been able to find the right recipe. I stumbled upon this one in Lidia's Italian American Kitchen Cookbook and thought I'd give it a try. We also had a friend from Minnesota visiting who would have killed me if I didn't make him pasta. Braised Pork Ribs with Rigatoni Ingredients 1 whole rack of pork spare ribs; cut into single ribs 1/4 cup olive oil 1 large yellow onion, sliced 8 garlic cloves, peeled 6 pickled cherry peppers, stemmed, seeded and quartered 2 35 ounce cans of Italian plum tomatoes 2 bay leaves 6 springs of fresh thyme 2-3 cups of hot water as needed 1 pound rigatoni 2/3 cup grated Parmigiano-Reggiano Directions Season ribs with salt and pepper. Heat the olive oil in a large, heavy braising pan over medium heat. Add as many of the ribs as will fit without touching. Cook, turning occasionally, until browned on all sides, about 10 minutes. Remove ribs and drain on paper towels. Repeat with remaining ribs. Pour off all but about 4 tbs of fat from the pan. Add the onions, garlic and cherry peppers and cook, stirring, until the onions are wilted and caramelized, about 4 minutes. Stir in the tomatoes, bay leaves and thyme. Bring to a boil, scraping the pan to loosen the brown bits stuck to the bottom. Tuck the spare ribs into the tomato sauce, season lightly with salt and pepper, and bring to a boil. Adjust the heat to simmering and cook, turning the ribs in the sauce occasionally, until the ribs are fork tender, about 2 hours. Ladle some hot water into the pot from time to time as necessary to keep the ribs covered with liquid. When the ribs are almost tender, bring 6 quarts of salted water to a boil and stir in the rigatoni. Cook the pasta until done, about 10 minutes. Drain the pasta and return to the pot. Spoon in enough of the sauce to coat the pasta generously. Remove from the heat and stir in 2/3 cup grated cheese. 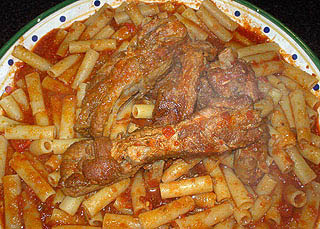 Transfer the pasta to a warm platter and top with the spare ribs. Serve immediately. I love PPN!! This is a great addition and one I'll have to try soon. It was really easy to make. The hardest part was getting the butcher to cut the ribs. He kept insisting they shouldn't be cooked that way. The recipe is fabulous. I'm so glad you decided to share with Presto Pasta Nights. What's up for next week?